Tire swings were great. If the rope was attached really high up in a tree you got to enjoy a long slow pendulous motion that was quite different than a swing set. But, there was always a hidden danger to tire swings. You would pull it back to a good starting position, hop up into the air and push your legs through the hole. Just as you start to enjoy the wind rushing against your face, you hear the familiar sloshing sound of doom as the rain water that had collected inside the tire overnight soakes the bottom of your shorts. 3 for 3. The only one left is McCoy. Oh man I wish I had a tree big enough for a tire swing. I miss tire swings, I ever see them around anymore. Or the not so familiar crackle of the tree trunk as it snaps off and you go rolling down the road in your tire. First of all, BRING BACK DDT! sure, it’s toxic, but only in large scale agricultural use, in it’s original purpose, it actually saved lives. in the year it was banned (1972), you know what killed more people than DDT, Malaria! the creator of DDT (Paul Muller) won a Nobel prize in medicine for it’s creation. Malaria would have gone the way of Smallpox in a few years if not for it’s banning. oh, yeah, typhus too. You know why that bottle of Off don’t do jack? Because they got rid of a chemical that was an irritant, repellent, and poison to Mosquitoes and Lice. Just my π¢. The other danger is that Mr. Wind has a tendancy to grab the tire swing and slam it against the tree. This has happened to me a few times. Rather fun, if painful memories. They took DDT OUT in the first place partially because it was killing our national bird. You know? Bald eagle? Because of DDT Their bodies couldn’t process calcium or something to that effect, and when they would lay their eggs they would have shells too thin and they would crack open upon being laid. Too soon crackage = no baby eagles. I never had a tire swing… I am a sad monkey. Well, from what I’ve read the DDT wasn’t actually affecting the eagles that much, it was some other factor, and the repellent did cut down the malaria, but whatever. I wish I had a tire swing. Honestly, the inside of a tire swing is uncomfortable enough without the water trap. I always thought the worst tire swing booby trap was when you jump in and scrape the crap out of your arm or leg on some exposed wire from the tire. Of course, then all we did was adjust so we didn’t get scraped up because we sure as heck weren’t going to stop swinging. Linuxxorcist, keep your rants to yourself. -.-; What did that have to do with Biff?! Relevant: For a minute I thought that there were some kind of evil bugs inside the tire. Not that I’m condoning (nor judging) rants in comments, but I just want to point out that DDT is an insect repellent, which is why it was brought up. @Chris; my stepfather did just that – took a pick-axe to the bottom of the tire swing and punched a few holes in it. I’m guessing that the tire is full of water, and the water is swarming with mosquito larva, hence the repellent action. No. There are others. Rouge, Kitty, Kurt-love (is a fan girl of Kurt Wanger). And the rain water is exactly why I try and ride on top of the tire. I never could figure out how to get the water out. DDT did affect the eagles, but it was because of bioaccumulation. You can look it up. I had played on tire swings but they were set up differently. As for the repellent, I guess it’s super strong. @Wind Lane been there, done that, have the scar to show for it. Still. We don’t have a tyre swing anymore because the tree is now in our front yard and apparently if any dumb kids jump on it and get hurt, we can be sued and stuff. Also, our tree drops branches, so we’d be constantly retying it higher and higher (the lowest branch that’s still attached to the tree is 19 metres up the trunk, and the tree itself it at least 30ish metres tall). We used to have a tyre swing at one of our old houses in the city, but one of my brother’s delinquent friends snuck over our fence sometimes. to use it. My dad got so pissed he took it down, not that I ever got to ride on it anyway(I was the youngest, so I got pushing duty). @Kit-Kun: While you are correct in realizing that there are yet more X-Men, the week’s theme seems to be the original line-up of Cyclops, Iceman, Angel, Jean Grey, and Beast. Man, with a roster like that, I can’t figure out how it was successful long enough to bring in the real stars of the show. dartigen – Whoa, just imagine the kind of swing you could get going with a 19 meter rope… Hafta be one strong rope, though. My dad did the drill-hole-in-tire-bottom thing after us kids pestered him with enough whining and complaining, as well as my mom because we’d change pants each time our behinds got wet, and she was faced with extra laundry. I had a tire swing while growing up and nodded and chuckled at the sloshing sound of doom. It became enough of a nuisance that my dad put a drainage hole in the bottom. 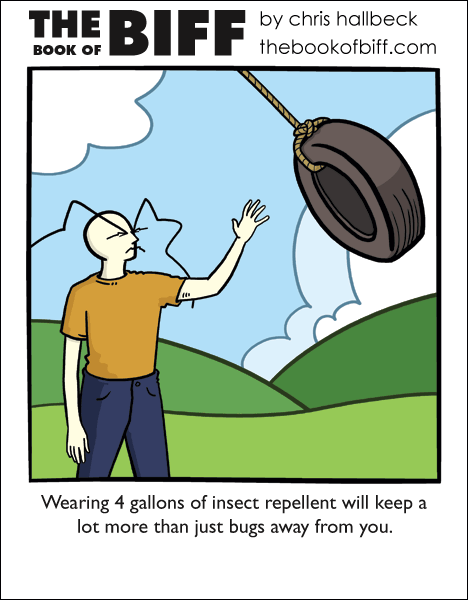 My brother and I enjoyed the tire swing for years, however, what made us stop swinging in it was the fact that wasps thought it was a good place to put their nests in. After a few stings and/or leaping out of the swing in midair to the sounds of the buzzing inside we were just too cautious after that. No I think you guys are all wrong. Im betting the tire swing, like a lot of biffs stuff, is animal like. If a toaster can act like a dog in biffs world, who says that swings cant have the mindset of a housefly? @Matt Lee:…He did a Rubik’s cube joke comic. It’s in the archives somewhere. I remember a classic ‘copy joke’ that had to do with tree swings – how various professions would do it (can’t remember what all of them were, but the lawyers panel had the ropes tied off on the tree and the seat tied to stakes so it couldn’t be used), and the last one: “What the customer wanted” and a tire swing. So are tires now part bug? And I was afraid of tire swings slightly because I was afraid of swinging into the tree! I didn’t have too much of a problem with water in the tire swings as a kid (being out on the prairies and all) but I did tend to sink into the middle of the tire and get stuck there with my knees against my chin and my arms and legs sticking out in a comical “cartoon dead animal” fashion. Always, always empty the tire first. Comon, that’s basics. DDT was an insect repellent, used on crops. When it rained, it washed the DDT into the local streams etc. As fish swim in and effectively ‘ingest’ the water that was now toxic, when the eagles came and ate the fish they got poisoned. When they laid eggs the shells were too thin, they broke, lack of eagle chicks. It’s not *directly* affecting the birds but significantly enough to make them ENDANGERED. That’s why it was banned, because there were so few of the birds left they were *this close* to being extinct. I hope we all see this as a problem, su? I still laugh at this. i never had a tire swing in my garden. maybe because i didnt have a TREE in my garden. Luckily, there was a tire swing down the road in the local park.